VANCOUVER — No tiebreaker necessary. 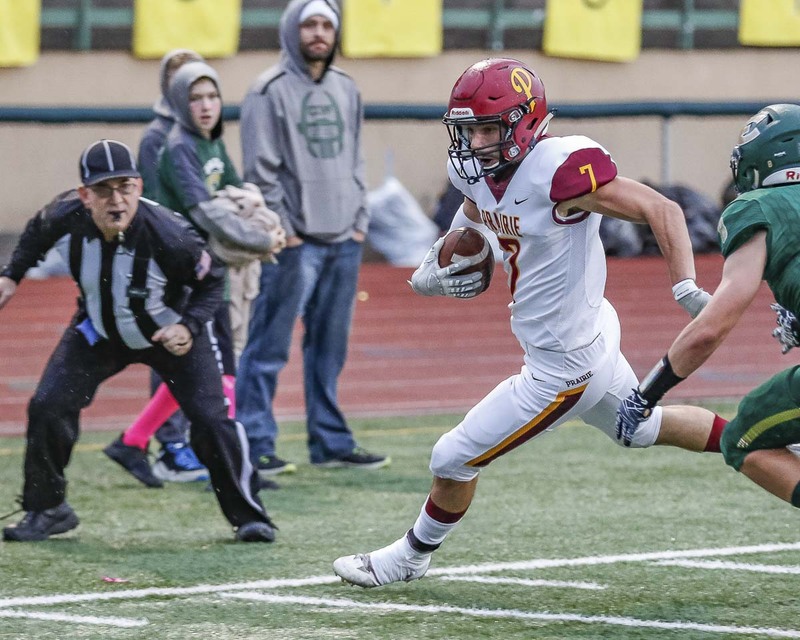 The Prairie Falcons secured the third and final playoff seed in the Class 3A Greater St. Helens League with a win over Evergreen and a Hudson’s Bay loss on the other side of town. A.J. 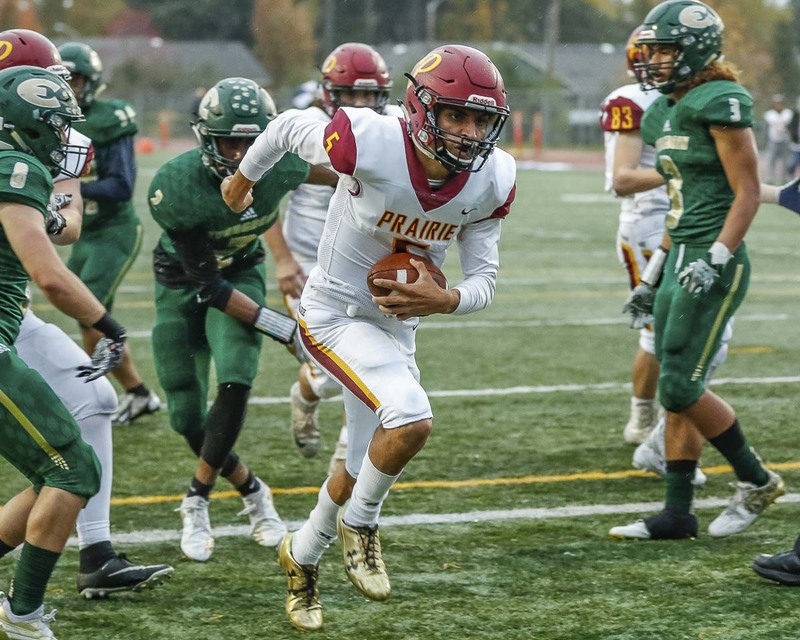 Dixson rushed for 130 yards and two touchdowns, and the Prairie defense nearly got the shutout in a 34-7 victory Friday at McKenzie Stadium. Prairie earned a winning regular season with the win, and more importantly, got to 3-2 in league play. Hudson’s Bay lost to Kelso on Friday, dropping the Eagles to 2-3. It is the first playoff berth for Prairie since 2011. Mountain View had clinched the league title last week. Kelso, at 4-1, finished second. Devante Clayton broke a scoreless tie in the second quarter with a 14-yard touchdown run. Dixson made it 13-0 before the half on a short TD run. Prairie scored less than two minutes into the second half. Bret McGuire scored on a 4-yard touchdown run. Minutes later, Dixson got free on a 41-yard tourhcodnw run. Clayton capped the Prairie scoring with a 15-yard run toward the end of the third quarter. 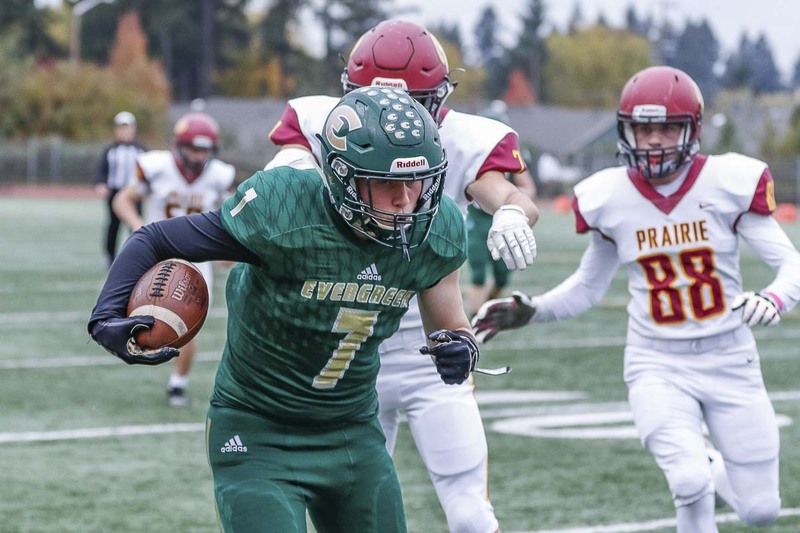 Evergreen avoided the shutout on a 9-yard pass from Ryan Blaize to Isaijah Griggs in the closing minutes of the game. Up until then, it was all Prairie defense. Douglas had 2.5 sacks, including one on the final play of the first half to thwart an Evergreen scoring opportunity. RUSHING: Prairie — McGuire 12-69, A.J. Dixson 11-130, Clayton 9-70, Zack Wright 3-34, Brown 1-1. Evergreen — Eli Vaa-leiataua 24-96, Ryan Blaize 6-(minus 41), Gideon Macabeo 3-24, Trent Heman 1-3, Zyell Griffin 3-0. PASSING: Prairie — A.J. Dixson 11-19-1-104, McGuire 0-1-0-0. Evergreen — Blaize 12-19-1-122. RECEIVING: Prairie — Nolan Mickenham 3-36, McGuire 1-(minus 5), Zeke Dixson 4-33, Bryce Cordon 1-6, Lawhead 2-34. Evergreen — Macabeo 1-13, Luke Allen 4-31, Zyell Griffin 5-59, Jaylen Fite 1-10, Griggs 1-9.